Police in Leeds are continuing to search for a convicted armed robber who escaped from prison. James Beeston, who is originally from the East End Park area of the city, absconded from HMP Kirklevington Grange in Yarm on Tuesday. The 28-year-old was jailed for 10 years in 2013 along with three other men who committed a series of armed robberies across West Yorkshire. He is described as white, 5ft 8ins tall, with fair/brown hair. 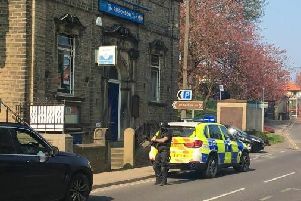 A West Yorkshire Police spokesman today said: "It is believed he may be in the Leeds area and officers here are currently carrying out enquiries to trace him. "Officers want to hear from anyone who has seen him or who has any information that could assist in tracing him. "He is not thought to present any immediate risk to the public but anyone who sees him is advised not to approach him and to contact the police on 999 immediately." Anyone with information is asked to contact officers via 101, quoting log number 975 of February 16. Information can also be passed on anonymously to the independent charity Crimestoppers anonymously on 0800 555 111.